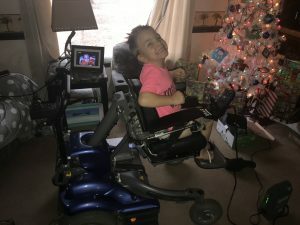 Ethan gets a power wheelchair! Five-year-old Ethan finally has his independence and he loves it! He received a power wheelchair that was donated to us and is using it every day! Ethan is diagnosed with Spastic Quadriplegic Cerebral Palsy, which is a form of cerebral palsy. As a result, he is unable to walk. Despite the challenges he faces, he is a happy boy who never gives up. Ethan enjoys many things. One of his favorite activities is trying to walk. He also spends time collecting superheroes, his favorite being Spider-man! However, to those who know him, he is a real-life superhero! The efforts of so many generous people made this happen quickly! We are so happy for Ethan! Go Ethan!